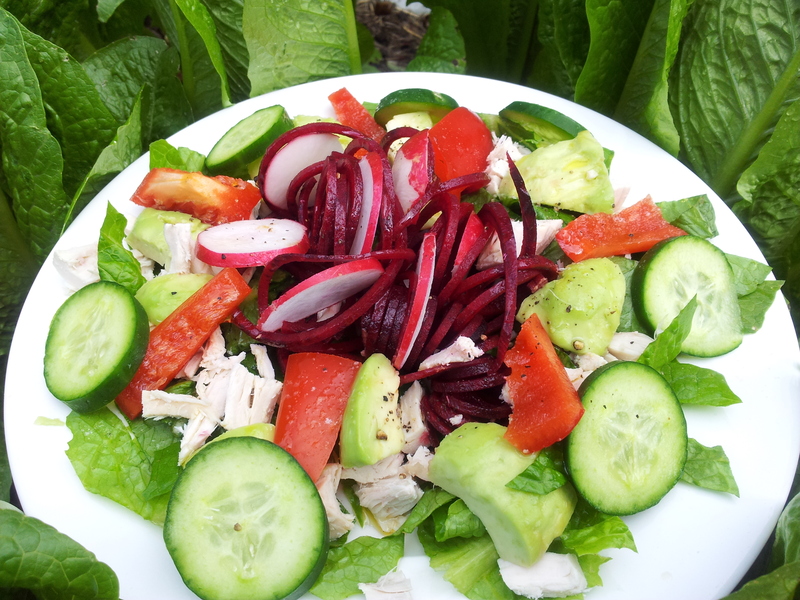 Add colour and flavour to your meal with raw or cooked beetroot noodles. They are so easy to make and lots of fun, adding a crunch if raw and a delicious sweetness when cooked. 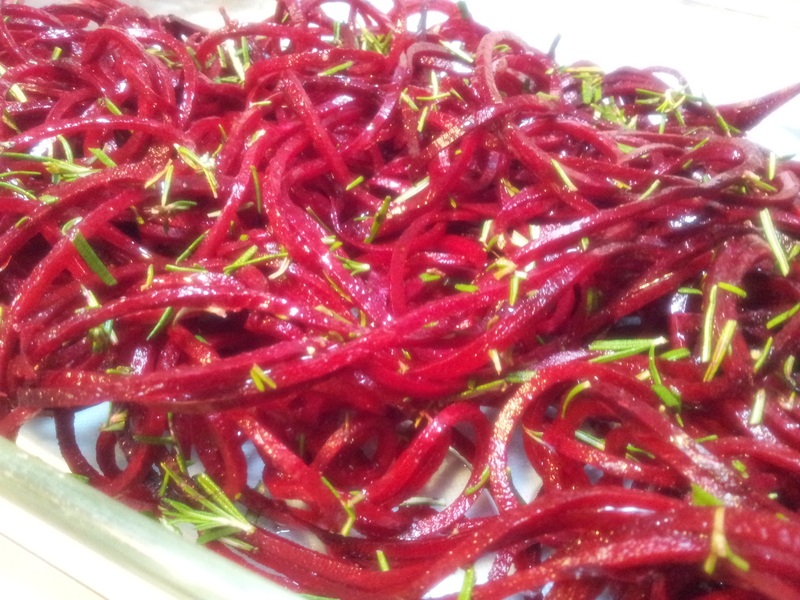 Raw rosemary and beetroot noodles ready for the oven. They are coated in extra virgin olive oil and seasoned with pink rock salt and black pepper. 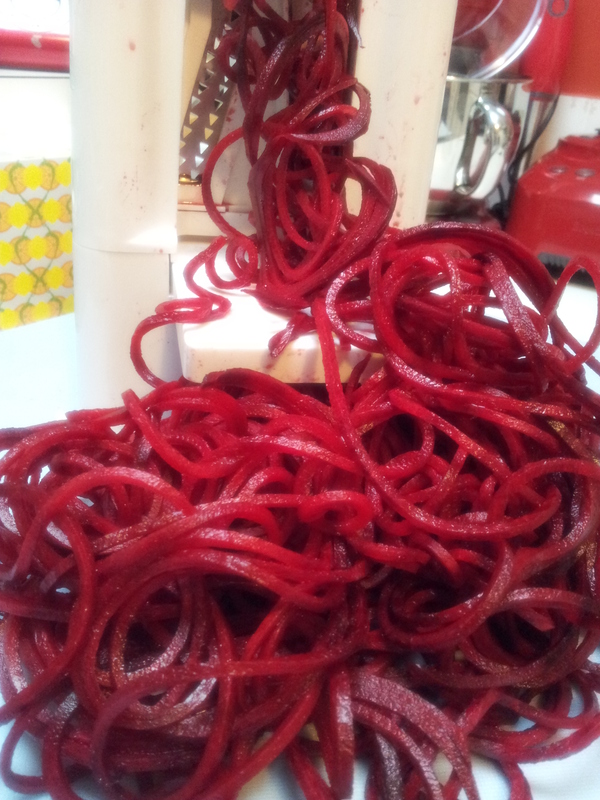 The noodle maker l have is a non-expensive plastic one l bought online but it is doing a fabulous job and l find beetroot works very well and l can make a pile of noodles very quickly. Firstly l peel the beetroot and then wash it, and I like to use large beetroots. 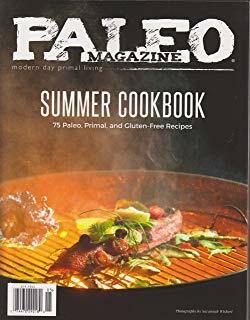 I would normally use one whole beetroot if l am having them raw or two if cooking them as they soften and shrink during the cooking process. Eating them raw means you need less as they are quite crunchy and require extra chewing than the softened cooked ones. The noodle maker is very easy to use and is easy to put together and wash. This one cost me around $35 online and does the job well. Using the raw noodles in a dish can provide a lovely centre piece to the dish as they are stiff and can be manipulated to provide shape and height. The other ingredients can be placed around the noodles or you could chop them into smaller pieces so they mix more uniformly into the salad. A colourful raw beetroot noodle salad where the noodles are the central focus of the dish. When cooking the noodles l like to bake them in the oven until soft and then place under the griller. Alternatively they can be lightly pan fried in a healthy oil such as coconut oil and spices which will give them a delicious flavour. 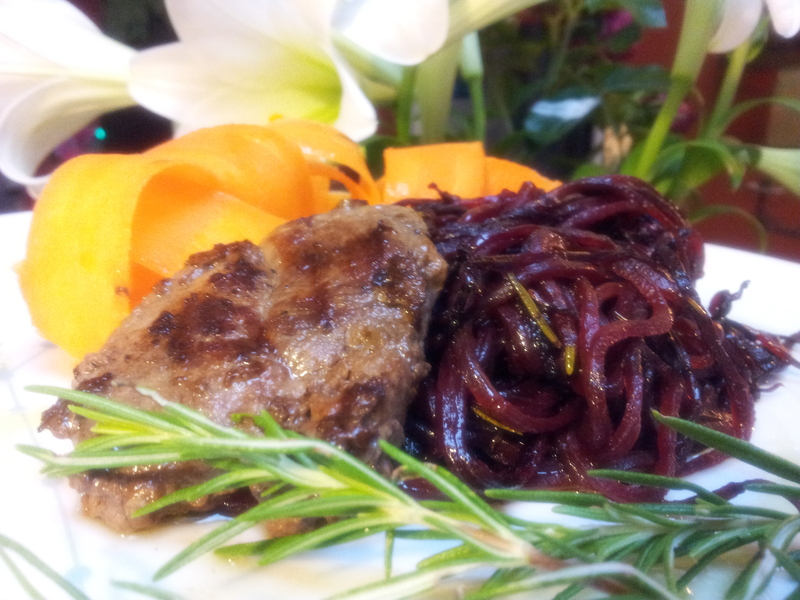 A generous pile of baked rosemary and beetroot noodles with grass fed beef eye fillet, carrot ribbons and cold pressed oil. The addition of rosemary to the noodles was divine and other herbs and spices could also be added to this versatile and delicious vegetable. A noodle maker is a fun addition to your kitchen appliances and can be used to enhance the presentation of numerous vegetables such as swede, carrot and sweet potato.